Structs enable you to create custom variable types to organize your data, by relating other c++ or UE4 C++ data types to each other. The power of structs is extreme organization, as well as ability to have functions for internal data type operations! In UE4, structs should be used for simple data type combining and data management purposes. For complex interactions with the game world, you should make a UObject or AActor subclass instead. //Always initialize your USTRUCT variables! Additional Note: The idea of USTRUCTS() is to declare engine data types that are in global scope and can be accessed by other classes/structs/blueprints. Because of this, it is invalid UE4 syntax to declare a struct inside of a class or other struct if using the USTRUCT() macro. Regular structs can still be utilized inside your classes and other structs; however these cannot be replicated natively and will not be available for UE4 reflective debugging or other engine systems such as Blueprints. Additional Note: Concerning the variables visibility on the editor: In the example above, if you don't add "EditAnywhere" parameter into UPROPERTY inside the members of the USTRUCT, whey won't show up in the Editor panel. You will see the variable but there will be no way to see/change/unfold the values inside. The class that defines a new UPROPERTY using that struct type should have that parameter too. In case you can't modify the data and you are using blueprints, you should add BlueprintType inside the USTRUCT parenthesis. You want to relate a float brightness value with a world space location FVector, both of which are interpolated using an Alpha value. And you want to do this for 100 different game locations simultaneously. And you want to do this process repeatedly over time! You need to store the incremental interpolation values between game events. and you want to track the lifetime of the particle and apply parameter changes from C++. You could write your own class, but if your needs are simple or you do not have project-permissions to make a subclass of UParticleSystemComponent, you can just make a USTRUCT to relate the various data types! Now you can have an array of these USTRUCTS for each particle that you spawn! However you must also clear ustructs you no longer need if they have pointers to UObjects if you ever want GC to be able garbage collect those UObjects. The struct that wants to use another struct must be defined below the struct it wants to include. My personal favorite thing about structs is that unlike UObject or AActor classes, which must be utilized via pointers (AActor*) you can directly copy the entire contents of a USTRUCT to another USTRUCT of the same type with a single line of assignment! If you have struct members pointing to UObjects or array pointers, you must be careful to copy these members yourself! This is because the data stored in MyStruct::MyIntArray is not actually stored inside of MyStruct. The new keyword creates the data somewhere in RAM and we simply store a pointer there. The address the pointer stores is copied over to MySecondStruct, but it still points to the same data. In fact, it would be counterproductive to remove this functionality since there are cases where you want exactly that. Additionally the Unreal Property System does not support non-UObject pointers, which is why MyIntArray is not marked with UPROPERTY(). However, copying arrays of integers (e.g. int32 instead of int32*) means the data is stored directly inside the struct and as such "deep copied". However, if you store a pointer to a UObject, this object is NOT deep copied! Once again only the pointer is copied and the original UObject left unchanged. Which is good because otherwise you might manipulate the wrong instance thinking you only had one to begin with leaving the original UObject unaffected, thus resembling a very nerve-wrecking and very difficult to track down bug! 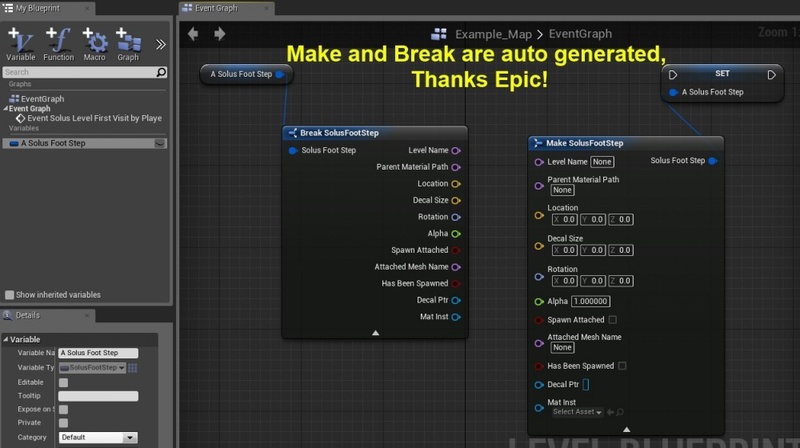 Marking the USTRUCT as BlueprintType and adding EditAnywhere, BlueprintReadWrite, Category = "Your Category" to USTRUCT properties causes UE4 to automatically create Make and Break Blueprint functions, allowing to construct or extract data from the custom USTRUCT. Remember that only UPROPERTY() variables of USTRUCTS() are considered for replication! So if your USTRUCT is not replicating properly, the first thing you should check is that every member is at least UPROPERTY()! The struct does not have be a BlueprintType, it just needs UPROPERTY() above all properties that you want replicated. In case you are looking for GENERATED_USTRUCT_BODY, in 4.11+, GENERATED_BODY() should be used instead. I love USTRUCTS(), thank you Epic!